Yup, that’s right. This weeks topic is a little more deep than usual. Why you ask would HowtobeSocial cover depression? Because it’s real and affects everyone, even me. In order to be truly social and be our best selves, we have to be able to learn our weakness and turn them into strengths. I would like to state some facts before we begin. Depression is not a joke. Some Americans will scoff at depression being a mental illness and even say it doesn’t exist but it is real and it can affect anyone. The reason for this blatant disregard of the truth is that depression did not affect our parents and grandparents like it does our generation and future ones. That is not to say that before us NO ONE EVER was depressed. It just means that today it happens far more often or is reported more. One in four will have some sort of mental illness in a year and one in five become depressed at some point. There are many reasons for that but to sum it all up into one statement, it is because our environment that we live in has radically changed. Before we get into that and how to deal with your depression we should discuss the different types of depression. Major Depression: (aka unipolar or major depressive disorder) Seven percent of the population has this type of depression and it has to last longer than two weeks for it to be categorized as such. Dysthymia: (aka Persistent Depressive Disorder) This illness affects two percent of our population and is more of a long-term depression, it is similar to major depression but it is not as severe. In children, depressed mood and irritability are often primary symptoms. Post-Partum Depression: (PPD) This type of depression seems to have the most effect on new mothers. While some mothers will go through what scientists called “baby blues” this is different because PPD tends to last longer. PPD can be particularly dangerous because it is often not talked about because mothers think there is something wrong with them because they think they are supposed to be experiencing joy and happiness before and after childbirth. 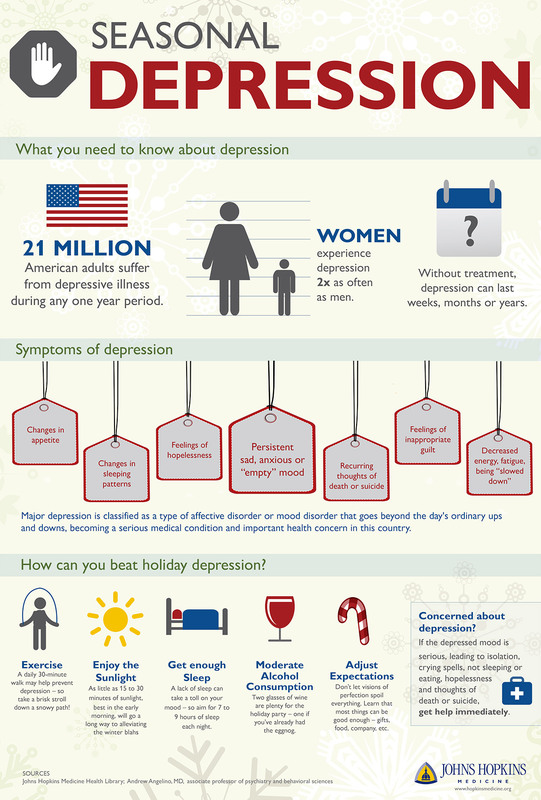 The change in hormones and body functions can be a cause of this depression. Seasonal Affective disorder: (SAD) The person who experiences this type of depression starts to develop symptoms around the holidays (aka this time of year.) Life naturally becomes more dreary with shorter days and this depression is actually just a subtype of major depression and can be just as detrimental to your mental health. Atypical Depression: This is anything but the name suggests. 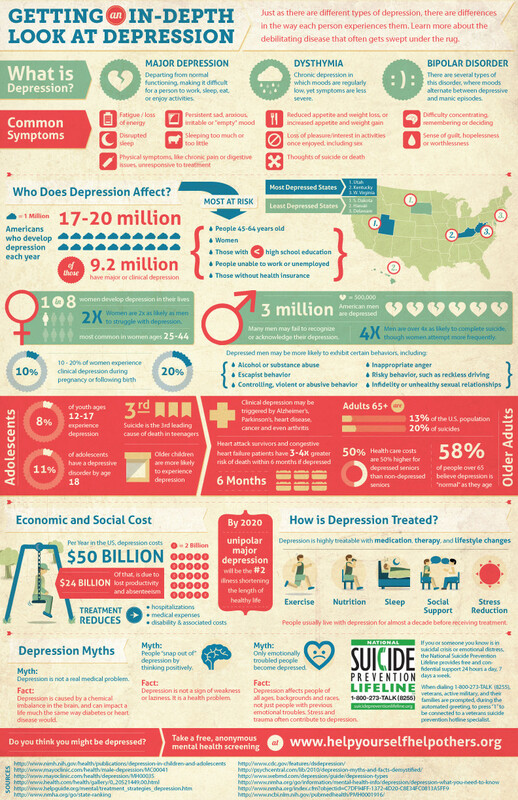 Atypical depression happens every day and can affect a persons enjoyment of everyday life. Women are two times more likely to experience this type of depression according to the American Psychiatric Association. Bipolar Disorder: A mixture of high and low moods. Mania is that high that people experience. They will have high energy, elevated mood, and they feel as though they don’t need sleep. This high is exactly what would be deemed as “too much of a good thing” because after using all that energy you crash – you hit a low. The low is the other half of bipolar disorder and is when you have low energy and feel hopeless. Bipolar disorder is more common than you think, with more than 3 million cases in the U.S. a year. Situational Depression: This depression is very common and often triggered by a traumatic event. A death in the family or close loved ones, a loss of job, or even school stress are all triggers for this type of depression. This can lead to other types of depression if not treated but usually only lasts for a small period of time. Premenstrual Dysphoric Disorder: (PMDD) Fairly new there is an argument over whether this is a depression state or just PMS. There is a huge difference between regular PMS and PMDD symptoms though. Doctors at this time are unaware of these causes of PMDD but they speculate that it has to do with an increase change in hormone levels during a cycle. Now that we know a little more about what we are dealing with let’s talk about ways you can deal with mental illness. Below you will find some great tips on how to boost your natural hormones and chemicals in your brain to get you going again! Just getting outside for ten minutes a day is proven to help you reset your circadian system and help you sleep better at night which helps battle depression. I understand that this might not work well for everyone though so keep on reading for more. If you find yourself trying these methods and not getting them to work then it is time to go to a doctor. You are not alone. Almost everyone goes through some form of depression in their lifetime. I know I just gave you a lot to go through but this is important because even if you don’t show symptoms of depression maybe your friend is. Please, talk about it. No one is benefiting by keeping the conversation silent. I have attached videos and links below for further research as well as hotlines to help you. AND PLEASE, know I am here for you. Message me anytime.